MADERA, CALIFORNIA (March 10, 2018) – Under threatening skies, 2016 Madera Speedway champion Matt Erickson won Saturday’s $5,000 to win opener for the RPM Mortgage Pro Late Model Series. The race was reduced to 80 laps with no scheduled breaks. The format produced a barnburner from start-to-finish with nearly a dozen lead changes across three different race leaders. Dylan Zampa won his first career 51FIFTY Energy Drink Jr. Late Model race as well in the busy afternoon. A noontime matinee show on the fastest one-third mile in the West opened with a B Main where Jason Romero of El Dorado Hills led the transferring cars while Erik Woods won the 25 lapper for a $500 cash prize. With the field narrowed down to 26 starters, it was 2015 and 2017 champion Buddy Shepherd of Bakersfield earning fast-time and proceeding to win the redraw for the pole position. Shepherd started alongside Jarrett Gilmer, with Gilmer one of five Jr. Late Model graduates in the field. Shepherd led early before facing a new foe in Lucas Oil Modified standout Linny White. White and Shepherd put on a side-by-side battling clinic that ran from laps 30 to lap 36 with the duo trading the lead on nearly every circuit. Shepherd had the lead by a nose when the caution flew on lap 36 for a severe crash on the backstretch involving Hollister’s Adam Lemke. The Jr. LM graduate tagged the backstretch wall head-on with Gilmer and Sheldon Cooper also suffering damage in the melee. When racing resumed Shepherd maintained the lead with White following closely over a series of restarts. 2017 runner-up Logan Zampa of Napa was in and out of the pits multiple times during the stint before finally retiring from the race with mechanical woes. A lap 51 attempt at a restart saw an accordion effect at the back of the field that ended Cooper and Racin Vernon’s evenings. The activity at the front of the field increased considerably from there onward, with seventh starting Erickson taking the lead. Erickson’s move to the front came in dramatic fashion when Shepherd slid up the hill in turn three and eventually fell back to fifth position. Erickson looked poised for the checkered flag while numerous battles continued in two-by-two fashion for second. A caution on lap 73 for rookie Christian Roche tagging the backstretch wall brought the field together for a critical restart. Erickson and Shepherd each took turns with the lead before Erickson took over on lap 76. A final caution on lap 77 for PCS Rookie of the Year Jack Wood spinning set up a three lap race to the finish. Erickson timed the restart well and managed to edge ahead of Shepherd and drive away for an exciting .155 second victory. Carlos Vieira stormed from 12th to finish third in his series debut with White and 2017 Rookie of the Year Austin Herzog rounding out the top-five. The 51FIFTY Energy Drink Jr. Late Models opened their third season of competition for drivers ages 10-16 years old and added a new face in the winner’s circle. Napa’s Dylan Zampa went to the front when it counted on lap 51 of the shortened 60 lap affair to take the crowd-pleasing victory. Defending champion Jesse Love of Menlo Park qualified third but got an assist when he drew the pole for the main event. Fast time qualifier Tanner Reif of Las Vegas and Bakersfield’s Kabe McClenny battled for second position before a caution on lap 14 for a multi-car crash in turn one slowed the action. Anthony Guiamano and Calvin Hegje were both out of the race as a result. McClenny restarted second while Reif restarted third and eventually fell to fourth when passed on the outside by 2017 third in points Austin Edwards in a later restart. Zampa started fifth and ran as low as seventh before chipping away at the pack. Zampa took away second from McClenny on lap 49 and two laps later did the same Love in a stirring set of passes. McClenny ended up passing Love a few laps later for second as well. Zampa started his 2018 season with a bang with the win with McClenny, Love, Reif, and Edwards the top-five. Third year drivers Lilly Mead and Jesse Burks staged a race long duel for sixth as well with Mead taking the position at the checkered flag. A strong 11 car turnout highlighted the 30 lap main event for the Toyota Sedans, with a ten car inversion placing fast-time qualifier Dean Gould deep in the pack. Derek Suggan led the first half of the race before Jillaun Holden and Gould entered the mix. A late caution placed Holden and Gould side-by-side, and Gould took off for a scant two car length win over Holden. 2017 champion Mike Marley snookered Suggan for third as well. The inaugural Mini Cups vs. Bandoleros race was dominated by Bakersfield drivers with young lady phenom Kercie Jung charging to a half lap victory in her Bandolero. 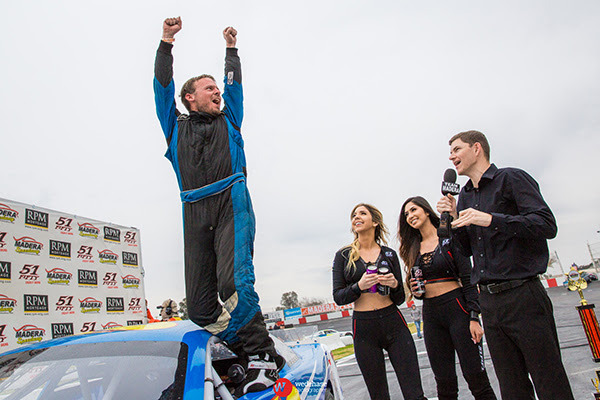 The former Kern County Raceway Park champion had no trouble topping fellow Bando drivers Seth Wise and Riley Massey for the win. The Mini Cup half of the field had much more drama, with Avery Vivian and Bakersfield’s Kale McClenny racing in close quarters throughout the clean and green 20 lapper. McClenny made the winning move around the outside on the final lap of the race to get the Mini Cup win. 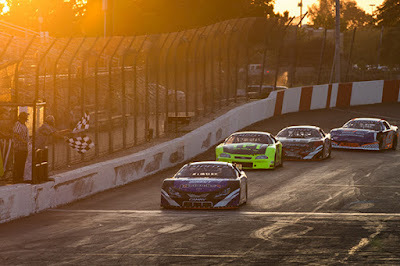 Racing continues at Madera Speedway next Saturday night with the Pacific Challenge Series presented by PenneyLawyers.com for a 75 lap Super Late Model race. The Western Winged Super Sprints, HPD Midgets, MST, 30 Lap Jr. Late Model Exhibition race, and F4 Beater Cross round out the card. 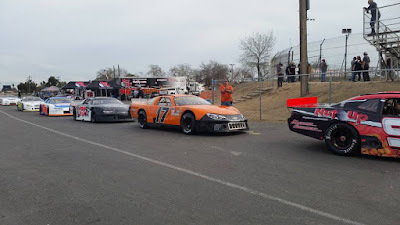 MADERA, CALIFORNIA (March 10, 2018) – Saturday's MAVTV-televised season opener for RPM Mortgage Pro Late Models, 51FIFTY Energy Drink Jr. Late Models, Mini Cups vs. Bandoleros, and Toyota Sedans has been pushed to a 12 p.m. starting time at Madera Speedway due to possible rain in the forecast. Tickets for Saturday’s event are value priced at just $15 for adults, $13 for seniors and military, $7 for youth ages 6-12, and kids five and under are free! 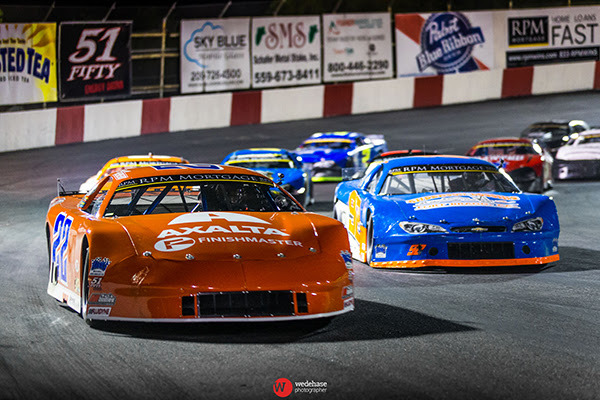 Madera Speedway is presented by major partners RPM Mortgage, 51FIFTY Energy Drink, Nut Up Industries, NICERIDE, iPull-u-Pull, and Color Fast Industries. 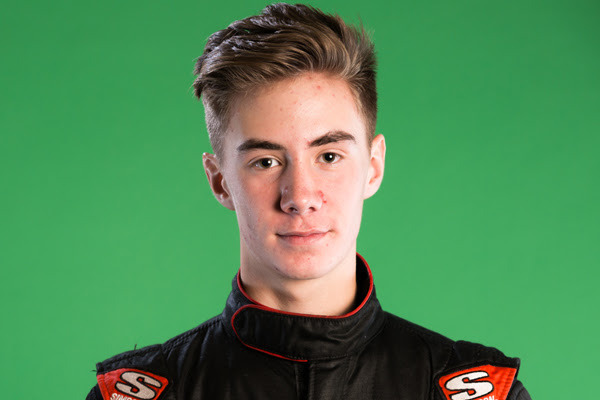 CLOVIS, CALIFORNIA (March 8, 2018) – Austin Herzog, 15, will make his NASCAR K&N Pro Series, West debut on March 15 at Kern County Raceway Park in the Bakersfield 175. Herzog will drive the #77 LC Services / Superior Door & Building Materials Ford for Jefferson Pitts Racing. Herzog will be paired with Monster Energy NASCAR Cup Series champion Kevin Harvick, multiple-time K&N race winner Will Rodgers, and Maine NASCAR Whelen All-American Series champion Reid Lanphear for a potent four car effort on the half-mile speedway. This will be Herzog’s second race with Jefferson Pitts Racing after competing with them in Kern Raceway’s Winter Showdown 300 Super Late Model race in February. Herzog is a six-time winner in the Jr. Late Model Series at Madera Speedway and also won the Rookie of the Year in the Pro Late Model division at the speedway in 2017. Both series were televised on MAVTV while his K&N debut in Bakersfield will be televised on NBCSN. Herzog’s efforts will begin with Wednesday’s testing, followed by practice, qualifying, and the Bakersfield 175 on Thursday evening. The testing on Wednesday will be a big aide as Herzog approaches the tricky speedway and gets re-acclimated with the heavier K&N West cars. Herzog has made one previous non-sanctioned steel bodied start in a 2017 race at Madera, finishing third. Herzog is a third-generation driver with both his father Bryan and grandfather Richard racing in stock cars. Race fans can keep up on all of the action for Austin Herzog Motorsports at www.AustinHerzogMotorsports.com Austin Herzog Motorsports can also be found on Facebook. MADERA, CALIFORNIA (March 7, 2018) – Alamo, CA-based RPM Mortgage, a leading private mortgage lender, continues as the primary sponsor of the Pro Late Model division at Madera Speedway. The MAVTV-televised nine race series has emerged as one of the premier weekly track stock car series in the nation, averaging nearly 30 entrants per race. The partnership between RPM Mortgage and Madera Speedway began in 2017 with both the lending company and the one-third mile asphalt oval enjoying great success as a result. 2018 is poised to be the strongest season of stock car action in the 47 year history of the Madera Fairgrounds institution. This Saturday’s 100 lap, $5000 to win season opener sets off a nine race campaign of RPM Mortgage Pro Late Model races that concludes with the “Nut Up Short Track Shootout” for $10,000 to win on October 6. Drivers from across the Western United States have flocked to Madera to compete in the unique series that features a strong payout thanks to a great sponsor base. Six of the nine races pay $2000 to win, along with $5,000 to win races on March 10 and July 28, and the $10,000 Short Track Shootout. RPM Mortgage’s involvement has immediately raised the profile of the series, explains promoter Kenny Shepherd. MADERA, CALIFORNIA (March 6, 2018) – 180 laps of RPM Mortgage Pro Late Model and 51FIFTY Energy Drink Jr. Late Model Series action kicks off the 2018 season at Madera Speedway on Saturday night. 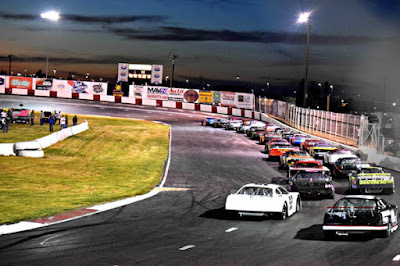 The one-third mile asphalt oval is poised for its best season of stock car racing in its 47 year history, with MAVTV coverage of nine nights of Late Model competition this year. The third season of the 51FIFTY Energy Drink Jr. Late Model Series sees the races expand to 80 laps over two segments. A 50 lap opening segment starts the race before a break on the front stretch for teams to make car adjustments and for MAVTV interviews. A 30 lap sprint to the finish concludes the grueling race for drivers ages 10-16 years old. 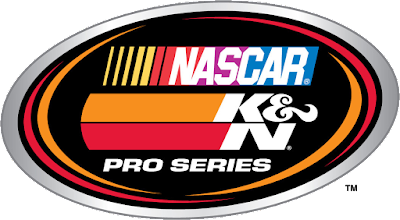 The series has been responsible for the introduction of drivers such as Hailie Deegan, Ryan Vargas, and Austin Herzog to the racing world, with all going on to compete in larger series. That trend is set to continue in 2018 with defending series champion Jesse Love, 13, running both the Jr. Late Model campaign but also in full BCRA Midgets. He will be one of the youngest drivers in the esteemed history of dirt Midget racing in the United States. Love’s title defense in the Jr. LM will be intense this year including 2017 third in points Austin Edwards, also 13, returning for his third season. Bakersfield’s Kabe McClenny, Las Vegas brothers Tyler and Tanner Reif, and Napa’s Dylan Zampa are all set to return. Zampa’s older brother Logan was the 2017 Pro Late Model points runner-up. 2017 Jr. Late Model runner-up Kolby Berry of Redwood Valley moves over to the Pro division with his brother Kyler taking the controls of the #88, while Southern California driver Olivia Manke is also among the crop of half a dozen rookies getting ready. Lilly Mead and Jesse Burks are also set for their third seasons in the series as the “veterans” of the youthful division. On the RPM Mortgage Pro Late Model side, $5,000 is up for grabs in their 100 lap season opener that will be divided among two 50 lap segments. Madera’s all-time winningest Late Model driver Matt Erickson won last year’s opener before Bakersfield’s Buddy Shepherd went on a tear to win his second championship. Erickson will look to improve on his fourth place standing last year in what is shaping up to be a high quality field. Ross Strmiska finished third in last year’s Short Track Shootout season finale and hopes to parlay that into a successful 2018 campaign. The rookie class will feature Strmiska’s teammate Christian Roche and Hollister’s Adam Lemke, who has a Pro LM career best finish of fourth last year. Logan Zampa of Napa, Modesto’s Garland Tyler, Erickson, and Madera Ranchos’ Dillion Tucker followed Shepherd in the 2017 points. Former track champions Rick Thompson and Howard Holden along with Bakersfield’s Racin Vernon and Clovis’ Shelden Cooper aim to improve on their 2017 seasons. Multi-time Modified Super Toyota track champion Kevin Thompson and multi-time Altamont champion Glenn Cook are also drivers to watch this season. Madera MAVTV cameras will roll for the inaugural Mini Cups vs. Bandoleros series event. The new concept will be a geographical battle with Mini Cups from Northern California and Bandoleros from Southern California racing head-to-head. Madera’s popular Toyota Sedan division starts its championship on Saturday also. An open practice kicks off the weekend on Friday before a full day of action on Saturday. Friday practice runs from 5 p.m. - 8 p.m. On Saturday, pit gates open at 11:00 a.m. with practice from 1 p.m. – 2:45 p.m. Qualifying will follow with the first races at 5 p.m. including the Mini Cup vs. Bandolero feature. Opening ceremonies are at 6 p.m. with Jr. Late Models, Toyota Sedans, and Pro Late Models to follow. Kern County Raceway wants to celebrate the homecoming of Kevin Harvick and his recent success in the NASCAR Cup Series! KCRP will have Happy Hours ALL NIGHT!! Five dollar beers!! All Brands, All Night! Thursday, March 15th! Come and celebrate and watch Kevin Harvick race for the first time at Kern County Raceway in the K & N Pro Series "Bakersfield 175 presented by NAPA Auto Parts". Also in action will be the top Late Model racers competing in the "Happy Harvick 50"
Gates for opening night at KCRP will open at 4:30 pm, with racing at 7:00 pm. Don't miss this historic night at "Bakersfield's Place to Race" - Kern County Raceway! MADERA, CALIFORNIA (March 6, 2018) – iPull-uPull Auto Parts, with locations in Fresno and Stockton, has increased its partnership with Madera Speedway in 2018 as the speedway prepares for its 47th season of racing action. iPull-uPull will present the 11th Annual Pumpkin Smash Halloween Bash which for the first time will feature Monster Truck and Jet Car action as well! iPull-uPull joined Madera Speedway’s family of great local partners near the end of 2016 and has increased its involvement while also adding a second location in Stockton. The self serve auto parts yard is owned and operated by many veterans of the salvage parts industry and has quickly become a popular stop thanks to a 60 day CASH back guarantee on all parts. Not only will iPull-uPull allow Madera Speedway to expand their efforts for the Pumpkin Smash on October 20th, but they will be a presence throughout the season with iBucks giveaways and monthly deal coupons that will be handed out to racers and fans. 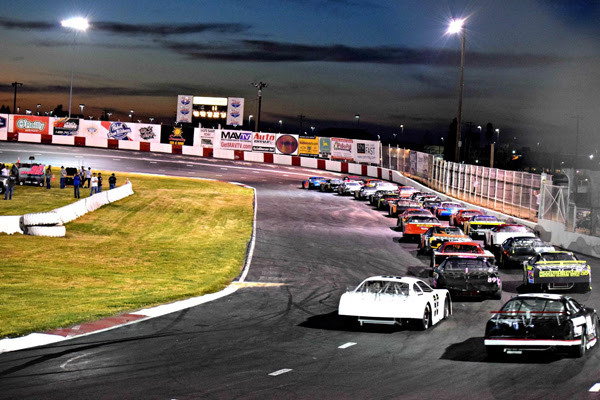 2018 is poised to be the strongest season of stock car action in the history of the Madera Speedway. This Saturday’s 100 lap, $5000 to win season opener for the RPM Mortgage Pro Late Model Series starts off a season of nine nights of MAVTV-televised racing, four prestigious regional Super Late Model events, several local nights of Madera Late Model competition, and several open wheel nights with divisions such as BCRA Midgets and Western Winged Sprints.